Since we introduced the world’s first truly handheld dry-well, many have tried to duplicate it—in vain. Despite its small size (2¼ inches high and 5 inches wide) and light weight, the 9100S outperforms every dry-well in its class in the world. It’s simple and convenient, too. Anyone can learn to use one in less than 15 minutes. It has a range to 375°C (707°F) and is perfect for checking RTDs, thermocouples, and small bimetal thermometers in the field. Plug it in, switch it on, set the temperature with the front-panel buttons, and insert your probe into the properly sized well. Compare the reading of your device to the display temperature or to an external reference, and the difference is the error in your device. With a proprietary Hart Scientific temperature controller, the 9100S has a display resolution of 0.1 degrees, an accuracy of ±0.5°C, a stability of ±0.1°C, and a stabilization time of just five minutes. For work in the temperature range of –10°C to 122°C, Hart’s Model 9102S dry-well is another first in the industry, featuring stability to ±0.05°C. This dry-well is only four inches high and six inches wide, achieves temperatures as low as –10°C, includes a NIST-traceable calibration, and is stable to ±0.05°C. 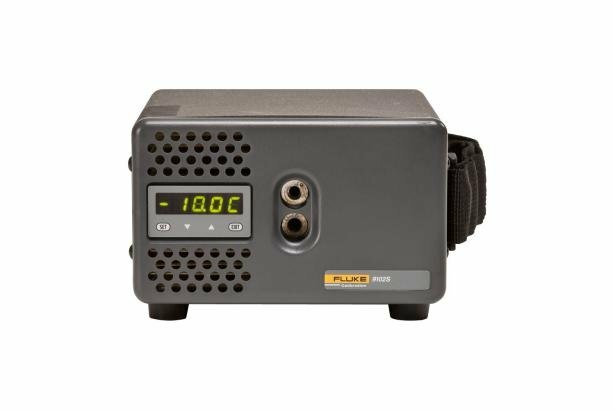 The Model 9102S is excellent for dial gauges, digital thermometers, bulb switches, and other sensors that need calibration below ambient. The 9102S has two wells so you can use one for a reference thermometer to increase accuracy. Both wells are 1/2 inch in diameter, and each has inserts available for almost any sensor size. The 9102S also has a battery pack option that gives you approximately four hours of field use when AC power is unavailable. Hart’s line of portable dry-wells is incredible. They’re the smallest, lightest, and most portable dry-wells in the world. And now they're better than ever!